At Huntsham Court our prices include all the essentials you need you need for a 2 night celebration with 20-130 guests: table lines, banqueting furniture, crockery, glassware, candlesticks, vases – all included in our prices. All you need to do is decide whether to bring your own caterers and alcohol or use our catering partners and alcohol suppliers. Simple prices. No hidden costs. No kitchen or storage fees. No extra guest charges. Minimum 19 Bedrooms for 2 night stays. Click here for the gallery of our 35 bedrooms. We charge no corkage so many guests have their own sale or return drinks delivered and our team staff the bar for them saving £1000s on hotel bar costs. Many guests take all 40 bedrooms, keep 5 for key family and rent the other 35 to friends for up to £200 per night = £14,000 back in the kitty! If you bring your own drinks you can set your own bar prices so you can have a break even or bar that makes up to £2000 profit to donate to a charity or your choice or the wedding costs. Take a third night? If you take all 40 bedrooms for your main booking we can offer a third night for just £4,500 extra. That’s an extra 24hrs exclusive use for just £49 pp (based on our 40 bedrooms sleeping 92 guests). Additional 40-60 bedrooms available in the local villages. Click here to view. You rent the house and you decide whether to bring your own caterers or use our catering partners. 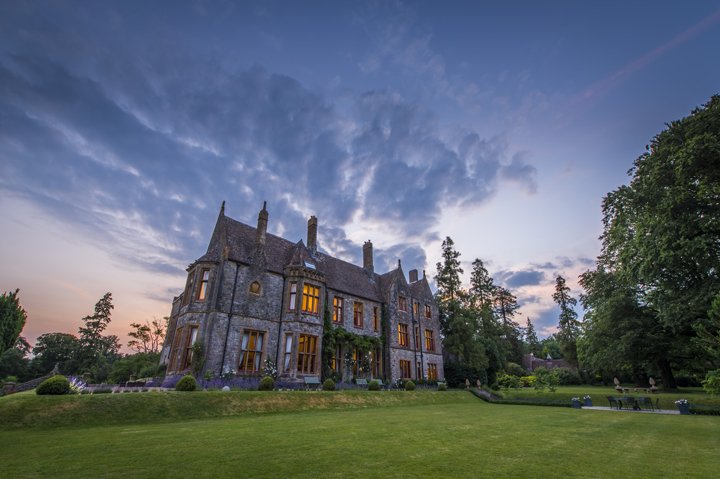 Huntsham Court has the largest sleeping capacity in luxury rooms and suites of any private exclusive hire country house across the UK. Up to 44 + 6 under 2yr olds. Up to 66 + 6 under 2yr olds. Up to 76 + 6 under 2yr olds. Up to 82 + 6 under 2yr olds. Up to 92 + 6 under 2yr olds. 2. 7 hours of planning help from our Event’s Team. 3. Complimentary use of our free banqueting crockery, cutlery, glassware, tables, chairs and one massive set of table linen included. Exclusive use of the property and gardens on the ground floor including the 3 ground floor bedrooms. Times: 10am until Midnight.